When 19-year-old huntress Feyre kills a wolf in the woods, a beast-like creature arrives to demand retribution for it. Dragged to a treacherous magical land she only knows about from legends, Feyre discovers that her captor is not an animal, but Tamlin—one of the lethal, immortal faeries who once ruled their world. Confession: I've never read anything by Sarah J. Maas before. I must remedy this soon. 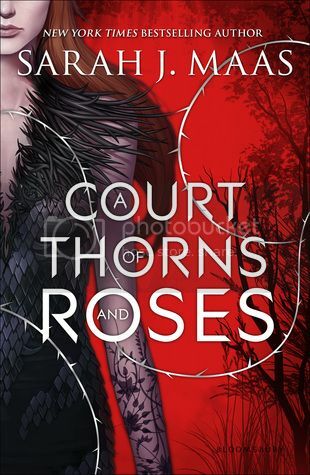 A Court of Thorns and Roses has the most stunning cover. And the story sounds pretty fantastic as well. Nice! I soooo can't wait for this one! I couldn't really get into her current series sadly, but definitely want to give this one a try! Couldn't agree more about the cover! OH HEY. I'm waiting on this, too! And OH MY GOSH you haven't read THRONE OF GLASS? You should get on that. Because THRONE OF GLASS. I really need this book now. I mean it sounds great, but it's Sarah J. Maas and that cover. Definitely need to get this book. You must definitely need to remedy that asap! Her Throne of Glass series is amazing and I'm dying of excitement for this one. That cover is so gorgeous! I read Throne of Glass when it first came out and thought it was good, but nothing impressive. I'm reading the sequel now.